JRC’s new JMA-5300Mk2 integrates the latest leading technologies with a set of new features that allows running radar images faster and more efficiently than ever before. The second generation and patented Constaview™ is realised through the use of three high-speed processors (in-house Tornado™ technology). All info gathered by the radar is fully processed within a few milliseconds before displayed, generating a smooth image rotation when sailing in Head-Up mode. When changing to North-Up, the new radar image is displayed without any delay caused by the scanner rotation. Other ship’s movement and speed can be monitored from length and direction of their trails, primary serving for collision avoidance. The JMA-5300Mk2 integrates four different trail length modes, that will show a ship’s course instantly, a unique operational feature that allows for more flexibility. Example real-time processing. The new JMA-5300Mk2 series integrates a wide dynamic range receiver that, compared to conventional models, significantly improves the differentiation of noise and targets under sea clutter. The radar system overcomes different sources of unwanted signals, maintaining a constant level of overall visible clutter. Developed exclusively by JRC, TEF™, allows target enhancement relative to the target size. The smaller echoes are far more enlarged than bigger echoes, giving a better on-screen separation and identification. TEF™ works by adding pixels to targets displayed on the radar image and allows a vastly improved degree of discrimination between targets. Sophisticated processing results in a proportional enhancement where the relative enhancement of smaller targets is greater than applied to larger targets. The JMA-5300Mk2 incorporates three Tornado™ processors, which are exclusively developed and designed by JRC, bringing a new level of performance and reliability to radar operation. The new Tornado™ processors, which equal the power of twelve conventional processors, and advanced system architecture make the JMA-5300Mk2 series probably the most sophisticated radar available today. The processor unit is the heart of the JMA-5300Mk2, and shares the same simple configuration as its predecessor, contributing to an enhanced system configuration. Optional TT (Target Tracking) function module with up to 100 targets, and or AIS interface, plotter control unit can be built in. With its new case design, the keyboard of the JMA-5300Mk2 series allows you to carry out all radar operations simply by using the keyboard or on-screen by use of the trackball. The responsive feel keys allow logical and precise operation and integrates function keys for one-touch access to EBL, VRM, GAIN, SEA and RAIN. This makes it easy to navigate through all common used tasks. 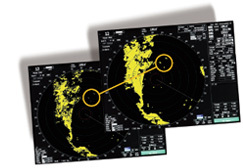 The JMA-5300Mk2 series make your radar images more brilliant than ever with a sharp 19” high resolution LCD screen. Menu selections, via the keyboard or trackball are clearly shown on the display - allowing “at a glance” interpretation of the radar image. You can also select day and night background modes and adjust the brilliance at your own convenience. As set by IMO regulations, a Consistent Common Reference Point (CCRP) is a location on own ship, to which all horizontal measurements, such as target range, bearing, relative course/speed, closest point of approach, or time to closest point of approach are referenced. Where multiple antennas are installed, different position offsets for each antenna in the radar system should be applied with respect to the CCRP. If you switch between scanners (up to 8 possible - option), the information displayed is generated allows for consistency and uniform output. This new feature is easily accessible from the menu. Optional interswitching up to 8 displays possible. Antenna length 6ft. 6ft. 7ft. 9ft. 6ft. 12ft. 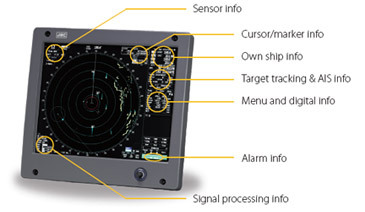 2)Performance monitor, ARPA or ATA, AIS and gyro unit must be fitted on ships compliant to IMO. WHAT'S STANDARD IN THE BOX?